Previous story Why Run A Cryptic Image Quiz? It's beginning to look a lot like Christmas everywhere you go! Take a look at the social campaigns glistening once again, with Facebook and Twitter aglow! That's right it's Christmas! People around the world are preparing for the big day, buying presents, decorating their tree and stocking their cupboards with food! Brands spend most of the year preparing for the holidays, so it's no surprise to see some great online activity this month. Costa are never one to shy away from a good Christmas campaign, last year they ran the 'Costa Christmas Giveaway' competition, where fans had the chance to win a number of great prizes with their very own advent calender! This year the brand are warming their customers up with a fun photo contest, asking fans to share their moments of festive fun! Whether it's a selfie, a groupie or just a photo of your favourite pet, Costa want fans to send their best Christmas snaps with their Costa Christmas cups. Costa have provided their audience with a microsite for the campaign, which allows fans to upload photos, customize their image, share it on social networks and then send it as an e-card to friends and family. Costa have been giving away several prizes each week to the best pics! Over 50's brand Saga Holidays launched an innovative Christmas Social Media campaign through Facebook and Twitter. The campaign is called 'Reveal To Win' and asks fans to share the hidden holiday and guess the destination for the chance to win a holiday for two to Greese! This is a fun and engaging method of revealing something to your fans. The basis of the concept is that each share to either Facebook or Twitter reveals a little more of the hidden picture. This campaign concept can be used as a competition where the winner is selected from all who guessed the picture correctly (like Saga's) or it could be a simple promotion to reveal a new product or even a group save voucher. 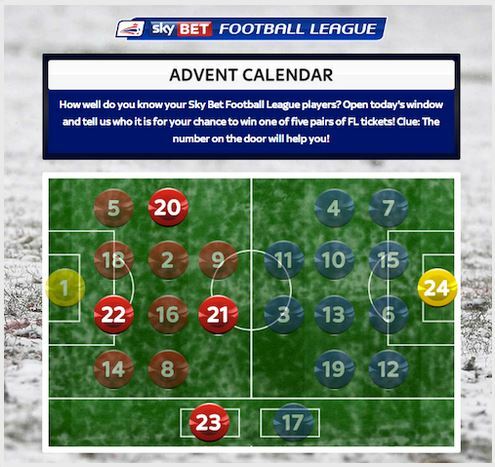 Sky Bet are this years new sponsors of the Football League and have launched an innovative online 'advent calendar' Christmas campaign for fans! Fans are invited to open up a door each day, and guess who the hidden player is underneath! Everyone who guesses correctly are entered into a draw each day to win 1 of 5 pairs of Football League tickets. Sky Bet gives fans a clue 'The number on the door will help you' meaning the number of the door is the same number as the player who plays for the football league team! High street brand Topshop launched a campaign this year called ‘Dear Topshop’ which is based purely on Pinterest. The brand is asking fans to create a 'moodboard' on Pinterest dedicated to the perfect Christmas day. The board can include decorations, your dream dress, tree of choice and any other pins that take your fancy! 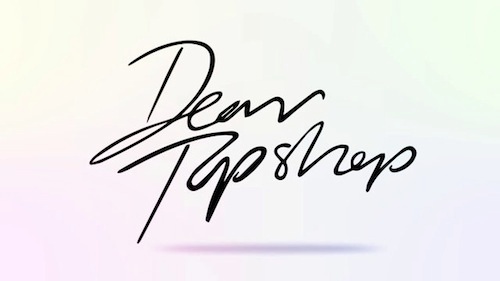 All pins must include the hashtag #DearTopshop, and then the board link must be submitted on Topshop's website! The best boards will be judged to win shopping sprees worth up to £500. Additionally, Topshop has also featured items that are being pinned the most on its homepage! It is not just consumer-based brands that have being running Christmas campaigns. B2B agency 'A Social Media Agency' this Christmas created an app that determines whether you are naughty or nice based on your Twitter account. The app named 'socialsanta' analyses a selection of any user’s tweets to see how many swear words they have used, and then gives a ‘naughty or nice’ result. Are you interested in running a social media campaign? Our software enables brands to launch a range of 'ready to go' campaigns across multiple social networks. Our concepts include cryptic image quizzes, photo/video competitions, question and answer quiz, caption contests, image reveal, x marks the spot and many more. We provide microsites for all our campaigns which sit on the users website, are fully customisable and can be white labelled. We can produce campaigns for Facebook, Twitter, Instagram, Flickr, YouTube, and Spotify.